Tabula Anemographica seu Pyxis Nautica... - LOTTER,T.C. Size : 19.7 x 23.0 inches. / 50.0 x 58.5 cm. Description :Tabula Anemographica seu Pyxis Nautica, vulgo Compass Charte. Rare engraved wind chart showing the compass disc divided in 32 sections, with text in six languages (German, Dutch, Italian, Latin, French and Spanish). 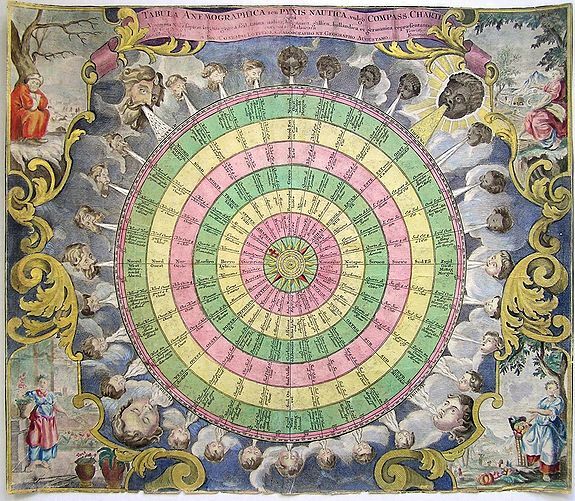 Surrounding the compass are 31 small cherub heads arranged in successive ages from young to old, and four large heads, blowing winds on the compass and seasons. The corners are decorated with large allegorical representations of the four seasons. With attractive hand coloring substantially heightened in gold and silver. Condition : Tight margins cut to neatline, wrinking, marginal tears past neatline, several small holes <5mm to interior of image, paper thin at places.